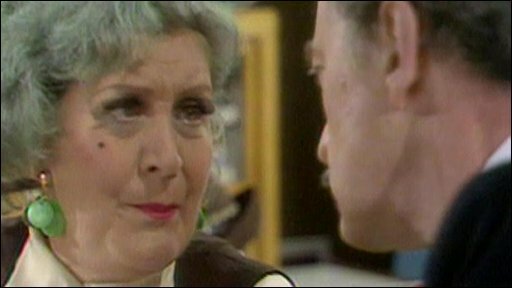 Frank Thornton, who played Captain Peacock: "She was great fun"
Actress Mollie Sugden has died at the age of 86, her agent has said. The TV star, best known for playing Mrs Slocombe in long-running BBC sitcom Are You Being Served?, died at the Royal Surrey Hospital after a long illness. The Yorkshire-born actress's twin sons, Robin and Simon Moore, were at her bedside, agent Joan Reddin said. 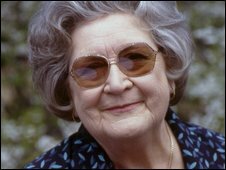 David Croft, one of the writers of Are You Being Served?, remembered her as a "marvellous character" who would never turn down chances to make people laugh. "She would never refuse any sort of comedy situation. No matter how undignified it was, she would always go along with it. She was marvellously funny," he said. Actor Frank Thornton, who played Captain Peacock in the sitcom, told the BBC she was part of a very happy team. "We all enjoyed each other's company, which, if you're doing comedy, is rather necessary," he said. "You can't play comedy with people you dislike. Mollie, of course, was an excellent comedian." Ms Reddin, who began representing Sugden in the 1960s, said the actress had become a "very close friend". "She had had a long illness and various problems but it was very quick in the end. Her twin boys were with her and she faded away. "She was a lovely, lovely person and I never had any trouble with her. She was a great professional." Sugden, who lived in Surrey, was married to fellow actor William Moore, best known for his role as Ronnie Corbett's father in sitcom Sorry! But she never fully recovered from his death nine years ago, Ms Reddin said. "They were very much in love. She started to go down when he died." Born in Keighley, West Yorkshire, in 1922, Sugden attended the local grammar school before training at the Guildhall School of Music and Drama. She went on to serve a long apprenticeship in repertory theatre before television gave her a taste of fame - and it was while treading the boards in 1956 that she met her husband. They married two years later, when she was 35 and he was 39. Their twin sons were born six years later. Sugden found early TV success with comedy series Hugh and I in 1962 and in Coronation Street as the gossiping Nellie Harvey. 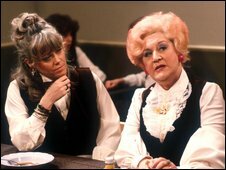 Sugden starred alongside Wendy Richard in Are You Being Served? But it was The Liver Birds in the late 1960s and early 1970s that enabled her to make her first real impact, as Nerys Hughes' snobbish mother Mrs Hutchinson. And then in 1972 came Are You Being Served? and the role she became best known for - the blue-rinsed Betty Slocombe, with her affectation of middle-class gentility and her outrageous use of the double-entendre. Sugden went on to have her own slot on consumer programme That's Life and even found new fame in the US where re-runs of Are You Being Served? transformed both Sugden and co-star John Inman into cult figures in the early 1990s.